It seems that in our eagerness to discover the latest new cult producer of Pinot Noir, we often overlook the veterans whose reputation has been firmly established through years of accomplished winemaking. I am talking about icons such as Ken Brown, a pioneering original in Santa Barbara County who continues to craft some of California’s most captivating wines. Byron Kent “Ken” Brown is a third generation California native who was born in Sacramento. Winemaking was not on his radar as he grew up and attended college, opting instead for a career in the burgeoning computer industry at IBM as well as working for his father who was a real estate developer. It was a visit to a Napa Valley winery that drew his attention to wine and he began making wine at home. In 1974, he enrolled in the California State University at Fresno’s viticulture and enology program. His interest in viticulture was noteworthy since most winemakers of the time spent little time in vineyards. This unique but now widely embraced adjunct to winemaking was to prove invaluable in his later success. Ken always considered himself a winegrower, that is, an equal combination of viticulturist and winemaker. After graduation, Ken became the founding winemaker at Zaca Mesa Winery in Los Olivos in 1977 where he designed and equipped the new winery. The original Zaca Mesa property was bought in 1972 by a group of friends who started planting a vineyard in 1973. 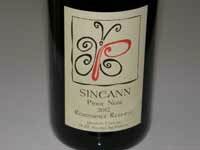 It was at Zaca Mesa that Ken planted the first Syrah in Santa Barbara County in 1978. In 1984, realizing the potential of Santa Barbara County and in particular the Santa Maria Valley to produce fine Pinot Noir and Chardonnay, Ken left Zaca Mesa and along with partners, founded Byron Winery in the Santa Maria Valley on the site of the original Nielson Vineyard. This vineyard was Santa Barbara’s first commercial vineyard established in 1974 by pioneer Uriel Nielson. The first Byron Pinot Noir was released in 1984 from purchased grapes (Tepusquet Vineyard 1973 plantings and Sierra Madre 1974 plantings). The success of Byron prompted the Robert Mondavi Corporation to invest heavily in the Santa Maria Valley eventually acquiring 600 acres of Santa Maria Valley land that included 175 acres of vineyards. Mondavi bought Tepusquet Vineyard in 1988, the adjacent 118-acre Nielson Vineyard in 1989, and acquired Byron Winery in 1990. Ken Brown’s 20,000-case Byron Winery was producing some of the best Pinot Noir and Chardonnay in the state, but he lacked the capital to grow the winery. Matt Kramer said, (New California Wine, 2004), “Byron Chardonnay has long been, and remains, one of the benchmark bottlings in Santa Maria Valley.” Mondavi’s buyout allowed him to stay on as winemaker and the winery’s production was expanded to more than 50,000 cases. While at Byron, Ken worked with many Santa Barbara County vineyards, but mainly sourced Pinot Noir from Nielson Vineyard, Tepusquet Vineyard and Sanford & Benedict Vineyard. In his time at Byron under Mondavi ownership, Ken directed the construction of a modern, gravity flow winery in 1996, and conducted a number of experimental vineyard programs. 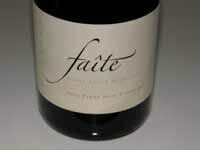 He eventually tired of the corporate winery milieu, and left in 2003 to start his own modest eponymous label. Ken Volk purchased the Byron winemaking facility and renamed it Kenneth Volk Vineyards. The Byron label passed through several owners including Constellation Brands, Legacy Estates Group, and Jackson Family Wines who is the current proprietor. Ken downsized considerably, with he and his spouse Deborah producing a modest 2,000-2,500 cases of carefully handcrafted wine under the Ken Brown Wines label. He occupied a shared warehouse facility in Lompoc beginning in 2005, and then moved to Terravant Wine Center in Buellton in 2008 where Ken consults for a number of other larger labels. • Ken was one of the first vintners to realize the potential of Santa Barbara County to produce world-class Pinot Noir and Chardonnay. • Ken was the first to introduce Pinot Gris, Pinot Blanc and Syrah to Santa Barbara County. • Ken was one of the first Santa Maria Valley vineyard owners to experiment with various vineyard spacing densities. • Ken mentored a number of respected winemakers including Jim Clendenen of Au Bon Climat, Bob Lindquist of Qupé Wine Cellars, Chuck Carlson of Curtis Winery, Lane Tanner of the former Lane Tanner Winery, Adam Tolmach of The Ojai Vineyard, Clay Brock of Wild Horse Winery, and Mike Sinor of Sinor-LaVallee and Ancient Peaks. 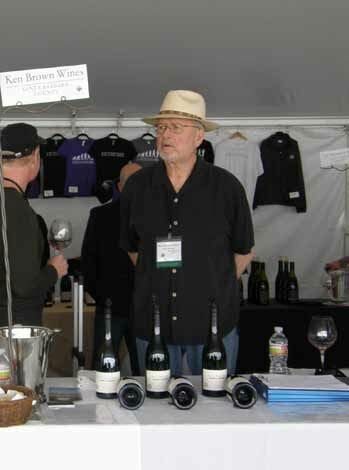 • Ken was the founding winemaker at Zaca Mesa Winery and Byron Winery. • Ken has crafted wines from some of Santa Barbara County’s most prestigious vineyards including Bien Nacido, Clos Pepe, Cargassachi, Garey, La Encantada, Nielson, Radian, Rancho La Vina, Rio Vista, Rita’s Crown, Sanford & Benedict, and Sierra Madre. Ken knows the lay of Santa Barbara County vineyard land. 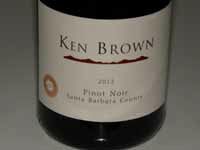 Varietals offered by Ken Brown Wines include Pinot Noir, Syrah, Chardonnay, and Sauvignon Blanc. 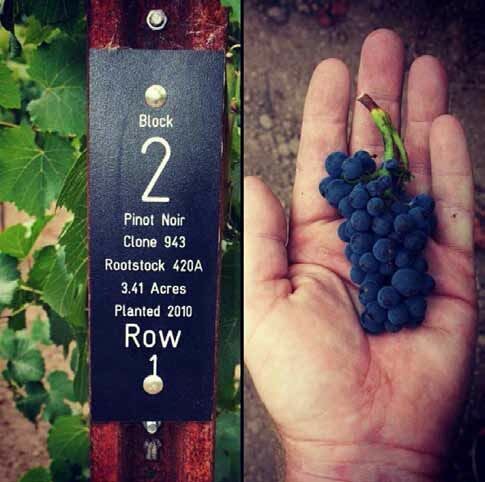 Since Ken has many long time associations with growers, he has access to desirable select blocks within vineyards. He buys fruit by acreage contracts so his name is attached to certain rows of vines. 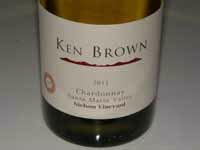 His sensibly priced wines are offered through retail channels and the website at www.kenbrownwines.com. Wine tasting is available Friday-Sunday from 11:00 to 4:00 or by appointment at the Terravant Wine Center tasting room located at 70 Industrial Way in Buellton (805-688-4482). Despite Ken’s status as a winemaker emeritus, he regularly attends events to pour his wines and patiently points out vineyard source details that he considers highly relevant to understanding his wines. He is modest, unpretentious, informative and beyond reproach as a professional. There is no need to seek out the latest Pinot Noir rave offering overpriced and over hyped wines, for we are blessed to have an easily accessible veteran who is still on his game. Acknowledgements go to the following reference sources used in this article: North American Pinot Noir (John Haeger, 2004), Salud! The Rise of Santa Barbara’s Wine Industry, (Victor W. Geraci, 2004), and www.winefactor.com. I headed straight for a local restaurant that had Ted’s Littorai wines on the wine list and ordered the 1992 Thieriot Sonoma Coast Pinot Noir. The wine was an epiphany, a revelation, love at first sip. The wine had the elegance, purity and balance that I had come to enjoy in a Williams Selyem wine, but the wine had its own character, a beautiful marriage of classic Old World Burgundy and New World flair. 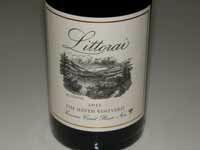 Littorai Pinot Noir quickly became the yardstick that I used to judge all other North American Pinot Noirs against. Although I have sought balance and harmony elsewhere and found it in a number of wines, I have always returned to Littorai as the standard. Ted’s story has been elucidated in detail in past issues of the PinotFile, but I will briefly note the high points here. In the mid 1980s, he returned to the United States from his winemaking tour at Domaine Guy Roulot in Meursault (Ted remains the only American ever to be the winemaker and vineyard manager at a major domaine in Burgundy’s history), and was hired by a French family to be the founding winemaker and vineyard manager for Chateau Woltner on Howell Mountain. The winery’s Chardonnays soon became a favorite among American wine connoisseurs. 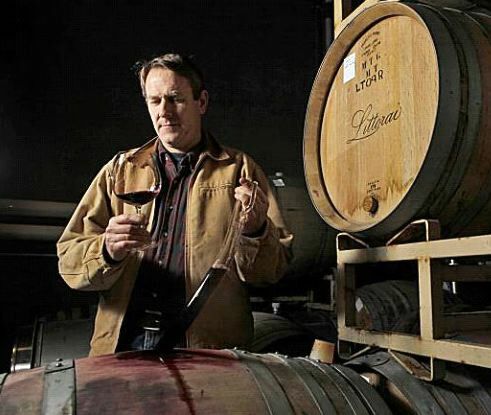 Once Ted’s winemaking and vineyardist skills were assured, he founded Littorai Wines in 1993. Ted believed the finest Pinot Noir and Chardonnay were grown along the true littoral (Latin for coastal) zone of the continent. He was convinced that the geology and mesoclimates of the extreme portion of the continent north of San Francisco were diverse enough to create a series of unique terroirs and his conviction has since been confirmed. Ted was one of the first winegrowers who believed world class wine production could be achieved in California using low yields, proper clones, vertical trellising, leaf removal, and other now commonly used viticultural practices. He was the first to create “by-the-acre” contracts for wine grapes in which he personally and closely supervised all aspects of vineyard management. 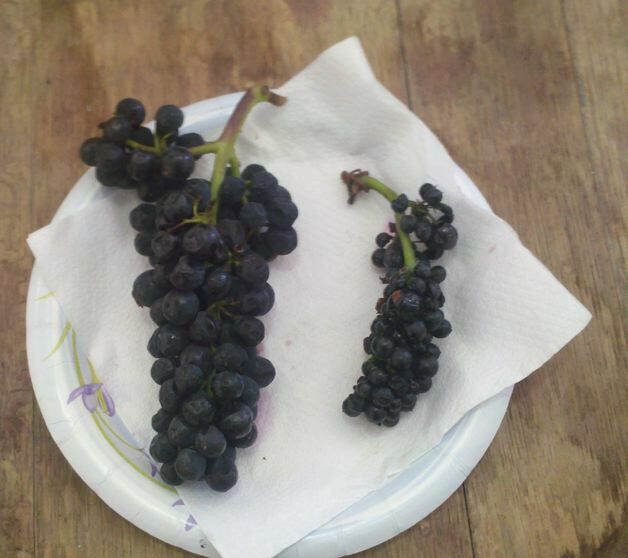 This type of contract is now the norm for premium Pinot Noir growers in California and Oregon. 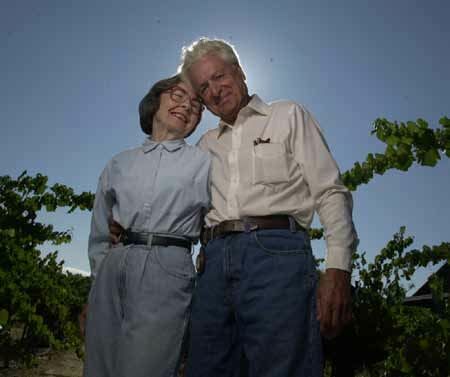 Ted was the first to vineyard designate Savoy Vineyard, Mays Canyon Vineyard and Charles Heintz Vineyard. He had a lengthy relationship with Summa Vineyard that was absolved through vineyard ownership change in recent years, and has enjoyed long-term committed relationships with Cerise Vineyard, One Acre Vineyard (part of Savoy’s Deer Meadow Ranch), Roman Vineyard, Hirsch Vineyard and B.A. Thieriot Vineyard. In addition, Littorai has developed estate vineyards including Pivot (pictured below), The Haven and The Tributary. A functional, but not extravagant winery was completed on the Littorai estate in time for the 2008 vintage. The winery is a straw bale walled building constructed on two levels on the side of a hill and is where Ted and his staff receives visitors. Visitors are offered both current releases and library wines for tasting. The intimate tasting experience is available by appointment only, Monday through Saturday, for a small charge. Phone 707-823-9586 or visit the website at www.littorai.com for appointment information. Littorai wines are available exclusively through a mailing list and fine restaurant placement throughout the United States. The wines often sell out quickly and are sold on a first-come, first-served basis. Wines can be picked up at the annual fall open house in October or shipped to your address. 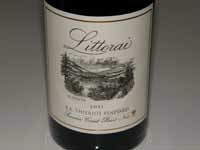 If you only splurge on one ultra-premium California Pinot Noir producer each year, Littorai should be a top consideration. Ted is a life long winemaker passionately committed to his craft. He did not come into wine as a second career. His wines adhere to a personal esthetic sensibility and his impressive track record of consistent excellence with multiple vineyard sources spans twenty years. 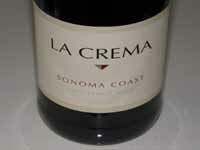 The winter 2011 releases included the 2012 Sonoma Coast Vin Gris of Pinot Noir, and the 2012 Sonoma Coast and Les Larmes Anderson Valley appellation Pinot Noirs. 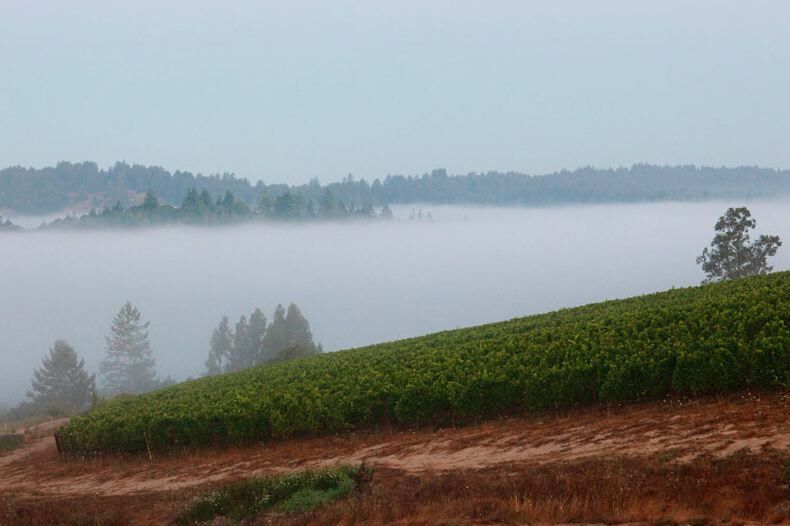 The 2011 single vineyard releases include Pinot Noir from Cerise Vineyard, Savoy Vineyard, One Acre Vineyard and Roman Vineyard in the Anderson Valley, Hirsch Vineyard, The Haven Vineyard, Pivot Vineyard, Platt Vineyard, and B.A. Thieriot Vineyard in the Sonoma Coast, and Mays Canyon Vineyard in the Russian River Valley. The following reviews are from a few of the wines that I tasted recently. Still very young, the aromas literally jumped out of the glass when tasted a day after opening. All the wines displayed spectacular elegance, freshness and transparency. I tried a little experiment at the end of my tasting, but Ted, who is a firm proponent of terroir will cringe, so don’t tell him about my experiment in terroir (or was it terror?). Wine is supposed to be fun, right? I mixed equal small parts of each of the above four wines just to see what would result. The blend exhibited satisfying black cherry, black raspberry and oak spice aromas. It was very tasty on the palate with impressive fullness and displayed the full spectrum of dark red and black fruit. The problem was that it tasted muddled, uniform, even corporate. The wine was very pleasant but not distinctive and any nuances were blurred. I clearly preferred the vineyard designated bottlings for their complexity and individuality. Don’t try this experiment at home. 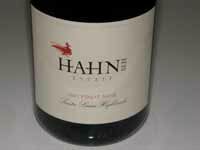 Hahn Estates debunks the misconception that large corporate wineries cannot produce outstanding Pinot Noir. The Hahn Family Wines lineup includes Pinot Noir under the Hahn Winery, Cycles Gladiator, Bin 36, Hahn SLH Estate and Lucienne labels. Total production of all Hahn Family Wines is about 400,000 cases annually from winery facilities in Soledad and Lodi (Cycles Gladiator label), making the winery one of the top thirty producers in North America. Located on the Monterey Coast in the Santa Lucia Highlands, Hahn Estates farms about 653 acres of vineyards in the Santa Lucia Highlands, 350 acres in Arroyo Seco and 160 acres in Paso Robles. The winery did not have a single Pinot Noir vine in 2000, but now has about 620 acres of Pinot Noir with 20 clones and is a leading producer of Pinot Noir and a supplier of Pinot Noir grapes to many other premium wine producers. Hahn Estate is the largest grower of Pinot Noir in the Santa Lucia Highlands AVA. The three vineyards in the Santa Lucia Highlands include Lone Oak Vineyard (146 acres of Pinot Noir, Chardonnay and Pinot Gris), Doctor’s Vineyard (243 acres of Pinot Noir and Syrah) and Smith & Hook Vineyards (254 acres of Pinot Noir, Chardonnay, Syrah, Grenache and Malbec). In the Arroyo Seco, the two vineyards include Ste. Phillippe Vineyard (290 acres of Pinot Noir, Merlot and Grenache) and Ste. Nicholas Vineyards (171 acres of Pinot Noir and Chardonnay). Andy Mitchell is the director of viticulture for Hahn Estate and Mesa Vineyard Management directs the farming operations of the estate vineyards. Much of the grapes are mechanically harvested. Founder Nicolaus (Nicky) Hahn is a Swiss businessperson, adventurer and philanthropist who became enamored with California wines while living in England, leading him to buy the Smith & Hook Winery in 1980. In 1991 he started the Hahn Estates brand and was one of initiators involved in creating the Santa Lucia Highlands AVA. 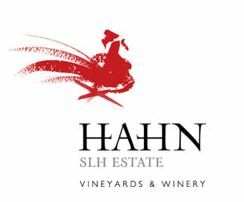 In German, Hahn means “rooster,” and the rooster is prominently displayed on the Hahn Estate label. The current Director of Winemaking is Monterey native Paul Clifton who learned his winemaking under veteran Don Blackburn at both Bernardus Winery and Byington Winery. After obtaining a graduate degree focused on cool climate viticulture from Lincoln University in New Zealand, he started at Hahn Estates in late 2002, and quickly assumed the position of head winemaker. Clifton’s assistant is Greg Freeman. When it comes to excellent value-priced Pinot Noir, no winery in California does it better than Hahn Estates. 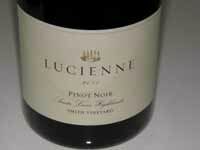 Hahn also has an ultra-premium Pinot Noir label, Lucienne, offering estate vineyard designated wines first released from the 2005 vintage. The Lucienne estate winery is a separate facility: a winery within a winery. The winery takes its name from Nicky Hahn’s middle name Lucien, but in the feminine form to honor the namesake of the Santa Lucia Mountain range where the vineyards are located. The 2006 and 2007 vintages were outstanding, the 2009 less so (the 2009 wines were originally reviewed in 2011 but tasted recently again with a better impression), and the 2011 wines are extraordinary. Hahn SLH Estate Culinary Center, a wine trade education venue, is located in Soledad and shares the panoramic views of the Hahn Estate Vineyard with the Santa Lucia Highlands. The Center is a space for seminars and wine tastings as well as a professional demonstration kitchen to allow pairing of gourmet and local foods with Hahn Estates wines. The Culinary Center is nothing new to other wine regions of California, but it is the first facility of its kind in Monterey County. Vineyard tours and tastings are offered at the winery Visitor’s Center and a unique estate ATV educational adventure includes a Reserve tasting in the VIP room. The tasting room is open daily at 37700 Foothill Road in Soledad. Visit the website at www.hahnestates.com for more information. Hahn is one of the ten tasting rooms on the regional River Road Wine Trail that parallels Highway 101 at the foot of the Santa Lucia Mountains. Visit www.riverroadwinetrail.com. The wines reviewed below are SIP (Sustainability in Practice) certified. When talk turns to the established wineries of the Russian River Valley, the names Gary Farrell, Rochioli, and Williams Selyem are often trumpeted. Less well known, but no less accomplished, is Mueller Winery, founded by Robert Mueller in 1991. 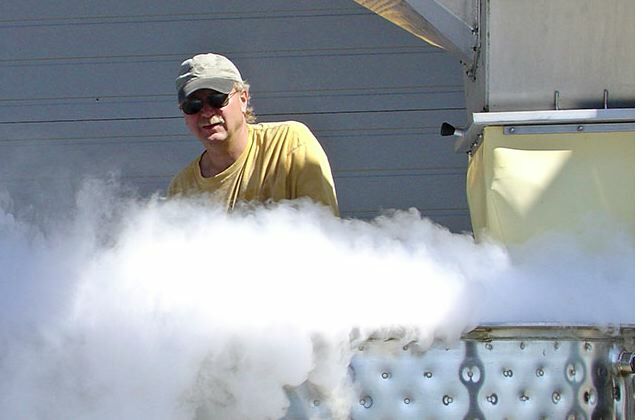 Robert received a bachelor’s degree in biology from the University of California at Santa Cruz and worked at Paul Masson Champagne Cellars in Saratoga as a chemist. He soon made the decision to become a winemaker and attended the University of California at Davis where he earned a masters degree in food science and enology. After graduation, he worked as a winemaker at Foppiano Winery, Charles Krug Winery, Pirelli-Minetti Winery, and in 1981, he became the Director of Winemaking for Souverain Winery. Three years later, he founded his own wine consulting business. 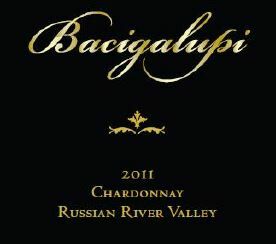 In 1991, he launched Robert Mueller Cellars with the production of 315 cases of “LB” Russian River Valley Chardonnay. The first “Emily’s Cuvée Russian River Valley Pinot Noir was produced from the 1994 vintage and became the winery’s flagship bottling. Initially the winery was located in Healdsburg, ten years later it was relocated to Windsor, and in 2013 returned to Healdsburg. A new tasting room opened June 1, 2013, across from the Raven Performing Arts Center in Healdsburg at 118 North Street. It is open Thursday through Monday. The Mueller Starr Road winery facility in Windsor was sold in May 2013, and production was moved for the 2013 harvest to a new modern winery, Punchdown Cellars, a custom crush facility in Santa Rosa. Production is about 4,000 cases annually. The winery is largely a two person operation with Robert handling the cellar and production duties, while his spouse Lori manages sales, accounting and compliance work. 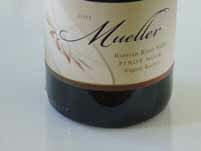 Mueller wines are available in the tasting room, on the website at www.muellerwine.com, and throughout the United States through retail channels. 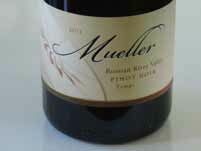 Mueller is best known for Pinot Noir, but produces several other varietals based on grapes sourced from the Russian River Valley. 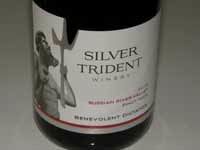 The Pinot Noirs are lush, extravagantly fruity wines exhibiting the bright cherry and cola flavors and moderately high alcohols that are the hallmarks of warmer Middle Reach Russian River Valley vineyard sites. 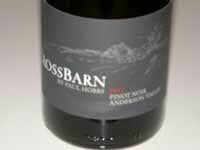 The wines are comparable in style to J. Rochioli, Merry Edwards and Kosta Browne Russian River Valley Pinot Noir. 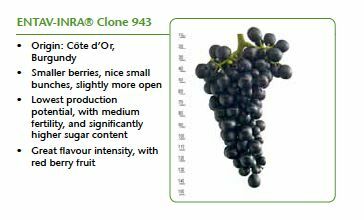 Grapes are typically picked at or above 25º Brix at harvest, 100% de-stemmed, fermented in 2-ton custom fermenting tanks using both indigenous and inoculated yeasts, and aged in 30% to 40% new French oak barrels. Mueller’s Pinot Noir vineyard sources are Vino Farms located east of Eastside Road (see map below). Vino Farms is one of California’s largest wine grape growers along with Bronco and Gallo. The 2011 “Harvest of Long Faces” produced solid wines from Mueller. Here are a number of outstanding wines to grace your holiday table and greet your guests in style. The 2012 vintage wines are beginning to appear in the marketplace and offer remarkably concentrated flavors that reflect the ideal growing season. Budbreak happened on schedule, fruit ripened slowly and evenly in the relatively mild conditions, and concentration and lush fruit character developed over an extended hang time on the vine. Entrepreneur Bill Price & Winemaker Gavin Chanin Introduce LUTUM Bill Price, owner of Classic Wines and Price Family Vineyards, along with Santa Barbara County winemaker Gavin Chanin, have launched a new Pinot Noir and Chardonnay label. LUTUM is Latin for “dirt” or “soil” and references the partner’s mission to make wines that reflect the great vineyards of California. The first wines will be released on November 12 through a mailing list offering and will feature small lots of 2011 Durell Vineyard Sonoma Coast Pinot Noir ($60) and 2011 La Rinconada Vineyard Sta. Rita Hills Pinot Noir ($50). Chardonnay will be added to the lineup beginning with the 2012 vintage, as well as additional vineyard sources including Bien Nacido, Gap’s Crown and Sanford & Benedict vineyards. Price, who owns part of the Durell Vineyard, the Gap’s Crown Vineyard and ownership interests in Three Sticks, Kistler, Kosta Browne and Gary Farrell wineries, was so impressed with Chanin’s winemaking talent and philosophical focus at such a young age (Chanin is 27-years-old), Price asked him to partner in a winery. Chanin was previously an assistant winemaker at Qupé and Au Bon Climat and has his own label, Chanin Wine Co. The wines are crafted at LUTUM’s new winery in Lompoc. For more information or to join the mailing list, visit www.lutumwines.com. French Wine Society 2014 Wine Immersion Study Trips to France. These unique trips offer an intensive, professional-level educational program on the ground in the wine region coupled with certification through the French Wine Society’s industry-endorsed Masters-Level program. The French Wine Society is a United States based nonprofit organization dedicated to French wine education. The trips are led by internationally experts in regions to be visited such as Andrew Jefford for Bordeaux, Kelly McAuliffe for the Rhone Valley and Elizabeth Gabay MW for Provence. The trips include high caliber wine tastings at some of the best estates in each region. They are nearly all inclusive with prices ranging from US $3,495 to US $3,895 per person, double occupancy, with each trip limited to 18 guests. Before each trip, participants get access to a Masters-Level Online Study program developed by the French Wine Society and after the trip, participants can validate their proficiency by passing the Masters-Level exam. For more information, contact jcamus@frenchwinesociety.org, call 1-202-640-5466, or visit the French Wine Society website at www.frenchwinesociety.org. 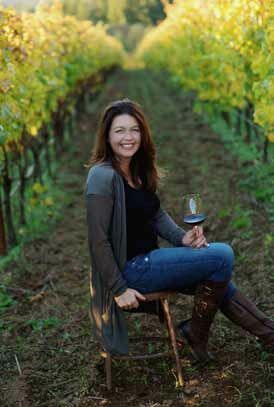 California Pinot Noir Quality Has Skyrocketed An article in The Drinks Business (www.thedrinksbusiness.com, November 6, 2013) reported the findings of Karen MacNeil at last month’s California Wine Summit. She stated, “The quality of California Pinot Noir has skyrocketed faster than any other variety.” A total of 126 wines from 17 appellations in California were sampled double-blinded by five tasters including Karen MacNeil, and the highest scoring wines were from the Sta. 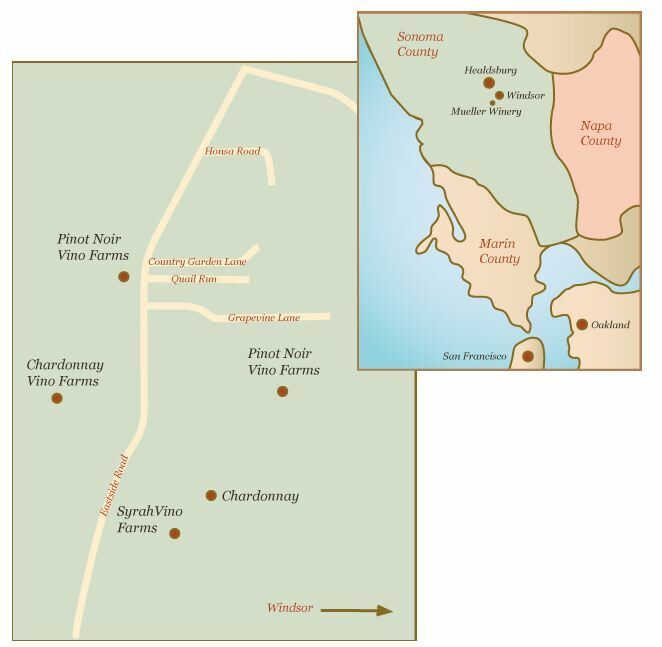 Rita Hills, followed by Sonoma Coast, Russian River Valley and Santa Lucia Highlands. Laetitia, located in the Arroyo Grande Valley in San Luis Obispo County. had the most top scoring wines in the tasting. International Corkscrew Auction ICC Auctions conducts collector corkscrew auctions online at www.collectorcorkscrews.com. The sales are ongoing and include over 900 antique and collectible corkscrews selling from $100 to $5,000. The first U.S. patented corkscrew (1860) sold in a recent auction for $8,000. Pinot Envy A new murder mystery from Edward Finstein (aka “the Wine Doctor”). Investigator Woody Robins, amidst the backdrop of the Napa Valley and San Francisco, tries to retrieve a stolen, priceless, large bottle of red Burgundy that once belong to the French emperor, Napoleon Bonaparte. A second book also titled Pinot Envy, written by SW Parra, consists of illustrations of humorous wine related observations with more than 100 clever and comical comments inspired by a wine joke book idea from Sommelier Pablo Sommelier. Both books are available at www.amazon.com. Wine and Teeth An Australian study recently published in Oral Health and Dental Management found that one occasion of drinking wine could affect tooth enamel by lowering the pH of saliva, although the effect is probably limited in the general drinking population. Wine tasters that swirl and hold wine in their mouth before spitting have a greater risk of dental enamel damage. The authors of the study recommended that tasters swig some water or milk after tasting and not brush which can aid enamel erosion. Carbonated soft drinks are probably more problematic than wine. Orange Coast Magazine Wine Dudes Blog Check out my blog posts at www.orangecoast.com. The posts are not confined to Pinot Noir (surprise) and offer a humorous slant to wine. My most recent post on November 5 is a satirical slant aimed at the government warnings on wine consumption. Must-Have Wine of the Week offerings include a number of varietals as well as Pinot Noir. 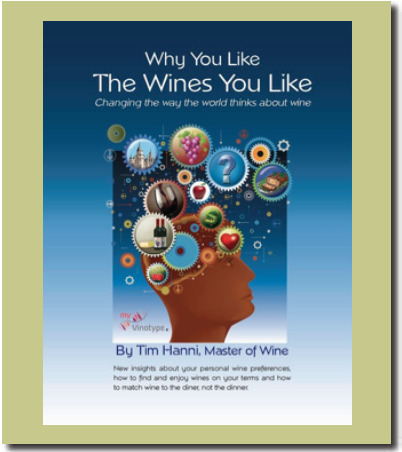 After nearly twenty years of researching consumer wine preferences, Hanni has identified four distinct groups of people he calls Vinotypes. 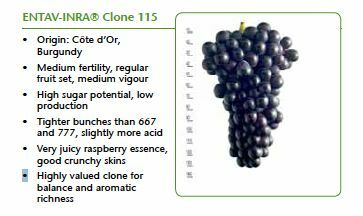 Finding your Vinotype allows you to discover wines you like and understand why others may have a completely different opinion of the same wine. Feel better already? Your Vinotype is “a set of observable characteristics resulting from the interaction of your genotypic sensory sensitivities in a wine related environment.” A simplified Vinotype sensitivity self assessment is offered in the book (a complete online version is available at www.myVinotype.com). I took the assessment and turned out to be “Sensitive” (the four categories are Sweet, Hypersensitive, Sensitive and Tolerant). The “Sensitive” category fit me to a tee: open to trying new things; satisfied with more delicate wines, yet able to tolerate, if not enjoy, full blown, high intensity wines; and tend to seek out better balanced, less oaky, and less over-the-top wines over time. The book’s paradigms are supported by scientific research and many delusions are debunked. The tongue, for example, is not mapped into four areas - sweet, sour, salty and bitter, but instead, the entire tongue can sense all of these tastes more or less equally. The one hundred point scale (OPHS) popularized by Robert Parker is really a 50-point scale since no wine can score less than 50 points by this method. Wine experts are not somehow specially endowed with super powers or sensory superiority. The book is rather exhaustive and a bit repetitive, but the message is clear and one that any wine lover can understand and embrace. Drink what you like and like what you drink. Available from www.amazon.com for $22.50.